It was time for a banquet. The ever-present clashing of steel and shouts rising from the training grounds had fallen silent, replaced by an even more dangerous sounding din emanating from the castle's kitchen, and even the dice cups in Yanna'en Marth had ceased rattling to make way for a hundred Elvish musicians with instructions to play until sunrise. The palace had been draped in flowers, lights, and colored banners, with the best and most striking soldiers in their dress uniforms flanking the main avenue. All this was surpassed in finery only by the lords and ladies streaming into the great hall. Perhaps the most impressive figure among them stood, back to a pillar, surveying the crowd. 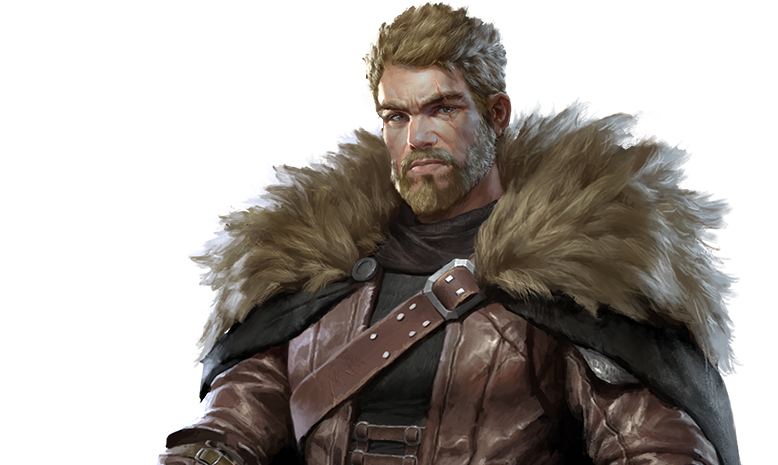 He stood as nobly as a statue of a King, with an equally impressive beard, but the jagged scar which ran across one eye left no question as to his familiarity with battle. He only needed to put on his helmet and pick up his broadsword to fit in on the front lines, as his expression was known to hold no matter the danger- the same twinkling eye, the same slightly mischievous smile. With a practiced air he surveyed the servers rushing around with hors d'oeuvres, the small groups of people laughing and drinking, the various secluded nooks and crannies.A new song started up, to scattered applause. His foot tapped lightly along with the orchestra, and, catching the eye of a passing beauty, he tugged his mustache and winked. He had taken two graceful steps in pursuit of her fading laugh when two large men, wearing what were obviously poorly hidden, sheathed swords under their long coats, intercepted him. "Fancy meeting you here, eh Vi-kator. If you will please, come with me," one grunted with a heavy northern accent, beckoning to a guarded doorway. “I believe I heard that maiden call me over. Another time, gentlemen.” Victor replied as he took a step towards the lady. “I insist, Vi-kator.” the brute said menacingly. "I must compliment your lord on the beauty of my escorts, as there are truly none here that are your equal" he deadpanned, buttoning his cloak as he began walking with the two large men towards the guarded door. Through the doorway, past another pair of unsmiling guards, baroque furniture scattered atop plush crimson carpet echoed the wealth displayed in the other room, albeit without the liveliness – truly the sanctuary of a stoic statesman. Near the back of the room a large map covered the heavy oak desk, and even a man ignorant of espionage could see the miniature flags exaggerated their dominion, as if waving with ambitious plans for the future... Behind this desk a man stood, hands clasped behind him, gazing down upon the city through a bay window. His uniform hung stiffly from his shoulders, starched enough to support the chest full of medals without sagging. His posture, however, couldn't bear such a load so gracefully. While bristly, his own mustache barely extended past the edges of his mouth. He didn't turn his gaze when he heard the footsteps, and cut short his guards announcement with the wave of a hand. "Ah, yes, hello, Victor. It is nice to finally make your acquaintance. I've long been a fan of your work. Loyalty is a rare trait these days, and one I respect, even if one is loyal to someone other than myself. Thank you for gracing us with your legendary presence, even if I must pull you away from the lovely party." "Yes, well, I do hope we shall finish our business before the festivities end." "Rest assured, you will not miss anything." "Thank you. Now, may we have a moment to ourselves...?" But neither Lord Roen nor his guards blinked. After a pregnant pause, Victor continued. "Yes…well, my purpose is no secret. I'm here on the orders of my Alliance leader to establish peaceful relations with your Alliance. The traditional killing periods will always be a time of bloodshed, and fights for the throne can quickly unravel the most iron-clad treaties. We understand this. But your Alliance attacks without regard or mercy, attacking our farms, attacking our weaker members, attacking those who cannot defend themselves. The sight of their castles burning lights the night from the mountains to the plains. We know the same can be said for your lands as well. This is no way to live, is it? What do you say, sir?" "Do you see these flags?" Lord Roen asked in a measured tone. "They represent the site of each battle where our respective forces have met. Now look closely. They all fly MY flag. Why is this? Surely even your own castle still flies its own banner?" "It soon shall not. This is my answer: there will be peace- when each and every castle that dared oppose me falls under my reign, or else is burnt to ash and borne away by the wind. You were foolish for coming. The party outside? I knew you couldn't resist, and in my own way, neither could I. I wish to give my guests a memorable and exciting evening, and who among us will ever forget the night that the great Victor was hunted and killed hiding in the hallways of my castle?" With this Lord Roen paused, letting the words sink in, while Victor waited in vain for an evil laugh. No laugh came. "I will make sure to inform my Leader of your decision. I am sorry to say we will both leave this lovely gathering in disappointment." Victor said with an obvious smirk. "Ah, but the walls of the city were bolted as soon as you arrived. The city is empty. There is no escape. Take solace, the last thing you'll hear is this lovely orchestra music. Guards!" And with this sharp command there was a bang, along with smoke and utter confusion, as the chandelier swung mightily across the ceiling and a figure slipped past the guards, through the doorway, and back out into the banquet hall behind. Above it all only the sound of Lord Roen could be heard - "Ahahahahahahaaaaa, after him! You there, strike up a new tune! The entertainment has begun!" Part of the crowd had turned to look in the direction of the commotion, and the other part, expectantly, to the band. Right then Victor came bursting through part of the crowd, and skidded to a stop next to the stage. Now every eye, including the musicians, was on him. A glance left, and right... The party had paused, drinks forgotten, the ever-moving waiters still, music silent but the violinists with their elbows lifted and bows poised. Victor raised his arms and cleared his throat. With a furious drop of his arms he led the band into their next number, a rollicking waltz, and as the crowd melted into partners for dancing, Victor, with a few deft additional conducting gestures, found himself face to face with the beautiful woman who had caught his eye before he was interrupted. "A dance, milady?" Victor inquired with a slight bow. "Will your friends come back to take you halfway through, good sir?" she laughed, taking his outstretched hand daintly. "Almost certainly," he replied, leading her smoothly through the whirling crowd. "How unfortunate, having so many friends. I'd love to have you all to myself for a moment." Victor pulled her a bit closer. Looking past her head at the large, unaccompanied men dotted among the crowd, he whispered in her ear, "Do you know of a nice quiet place we can go?" She nodded in reply, and the couple tangoed together to the edge of the floor. They broke from their embrace and she led him by the hand towards the brightly lit main staircase. "But this is the main exit..." Victor started, but the twinkle in her eye stopped him short. As they neared the staircase, she took her hand from his, bending down to remove her heels, and climbed onto a windowsill. She looked behind her. "You're not afraid of heights, are you?" she asked, pushing the large window open. "It's the best view in the entire city." And with that, she stepped out onto the ledge. Victor cast a quick glance behind him. The lumbering figures had worked their way through most of the crowd and were beginning to make their way toward the front entrance. He shrugged ever so slightly and climbed up after her. Just then he heard a shout, and saw one of the men pointing his direction. The view was better than advertised. Between the heights, the lights, the smell of the flowers hanging below their feet, the floating airship illuminated against the night sky as it sat far below the castle, it was a wonderful sight. They inched out along the edge to a small nook where they could sit rather comfortably, if you don't mind your feet dangling over a hundred foot drop. "Ah it's such a lovely night... I wish I could stay here forever," she began, but her endearments were cut short by the bustle of soldiers far below, and the sardonic voice of Lord Roen winding its way out of the window. "I didn't see you as a hostage taker, Victor. And you've backed yourself into the most unpleasant of corners. My men have you surrounded. Come, now..."
Victor winked at his companion. "I'm afraid I won't be able to stay here with you much longer, though I must agree, despite these oafs and their shouting, this is a lovely view. Thank you for sharing it with me." Confused but charmed, she could only manage to stammer "you're welcome," as Victor stood and responded to Lord Roen. "I'm thankful to be able to provide some entertainment at this lovely gathering. I'll be sure to inform the entire Kingdom of your generosity." "Cocky to the end, I see. Guards! After him!" And as two of the men clambered onto the ledge, Victor crouched down to get a firm hold on the colored bunting decorating the castle. No time for more than a smile over his shoulder, he leapt off the balustrade. With a tremendous tear, Victor's fall slowed and turned into an arc as the ripping banner swung him out parallel to the castle, past the guards below, and dropped him with a soft thump into a flowered hedge far below the castle's walls. Far above him, among the continued shouts he could only hear the piercing voice of Lord Roen... "Faster! Get in the city! He hasn't escaped yet!" But Victor, with that preternatural coolness which had served him so well before, any time the shouting and commotion and excitement and sighing women and furious enemies were at his back, simply strolled towards the port where the zeppelin sat tethered and untended. The entire city was buzzing for days after, and Lord Roen the toast of the town for the daring man he hired for the night's entertainment, who flew the city's zeppelin so close to the castle you could almost see his smile.